Your package is too important to leave to just anyone, which is why we’re very particular about who completes your delivery. Our professional, uniformed couriers work their magic with friendly smiles and upbeat character, and have been awarded by both city and state agencies. Package in hand and quality service at work, our New York courier service turns eager customers into happy customers. Our signature branded fleet is the backbone of our New York City courier service, allowing our drivers to cover every city corner and street. We keep our vehicles extremely clean and well maintained to ensure efficient, reliable deliveries. Equipping our entire fleet with built-in GPS systems, our dispatch team can track your driver’s status and provide you with real-time ETAs. Certain delivery situations require extra care and attention. As an extension of our courier service in New York, RDS Same Day Delivery offers specialized delivery solutions, including white-glove service, medical specimen delivery and more. Give your critical package the extra care that it needs, and expect only the best from our experienced professionals. In today’s business environment, information management is no longer optional. Increasing government regulations and rising demands to protect personal information are changing the scope of storage needs. As a result, businesses need professional management for both records and freight. Offering 24-hour video surveillance and climate control, our facility saves you office space and protects your documents as closely as you would. It’s true what they say: time is money. With your RDS Same Day Delivery account, you can spend less time scheduling orders, and more time making money. Using the RDS portal, you can point, click and ship with real-time status updates right at your fingertips. You can also enjoy quick and easy access to invoices, statements, delivery information and more. When you’re on the move, track your order using our mobile app to receive instant updates. Wouldn’t it be nice to have a bird’s-eye view of your package? With our real-time status updates and tracking capabilities, you can monitor your shipment up to the minute. We provide all of our messengers and drivers with GPS to ensure complete transparency. At the end of the day, it’s your package—which is why we never let it leave your sight. 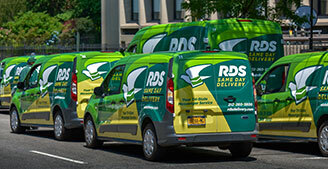 RDS Same Day Delivery has an on-time delivery rate of 98.7 percent, making our company the fastest in the city. When your delivery just can’t wait, there’s no other team that will do the job quicker than us. Demand the very best for your shipment, and trust the professionals that are on time, every time. Our uniformed messengers do more than just wear our colors; they represent the consistency and unwavering values of our company. We choose to provide not only a service, but also an experience. When you schedule your shipment with our team, you’ll know exactly what to expect: upstanding professionals and uncompromised quality. It takes a skilled veteran to master the city streets. At RDS Same Day Delivery, we know the Big Apple like the back of our hand, allowing us to provide the fastest delivery times possible. We’re the team that knows how to beat the clock as much as the traffic. Our winning strategy, combined with our advanced technology, ensures an ideal outcome for you and your end-user. Share some details with our team to get a quote for your project. We know that your schedule is tight. Using our Customer Portal, you can schedule your same-day shipping orders in mere seconds. You can also print labels and bill of ladings, and then track your order through every phase of the delivery cycle. We’ve gone mobile—so that you can go global. Using our HyperShip App, you can place & track your order from any corner of the world. Download our App today, and keep peace of mind in your back pocket, 24/7. You shouldn’t have to jump through hoops to ship your package. Instead, you can download our desktop icon, and access our Customer Portal with a simple click of the mouse. Our custom invoicing allows you to bill back every order to a specific client code, project number or an internal reference. Even more, all of our invoices can be sub-grouped and sub-totaled by department or reference. New York City is a place where dreams are born and businesses can make it in the big leagues. But, how does all of the magic happen? It begins with the company that helps businesses thrive and customers rest easy in the city that never sleeps: RDS Same Day Delivery. Cost control, speed, reliability—all of these are crucial components of a successful delivery. Unfortunately, though, many courier companies in New York fail to offer the whole package, touching only the surface of dedicated 3PL solutions. At RDS Same Day Delivery, we go the extra mile for our customers—and we finish first with the city’s fastest delivery times, too. When your delivery just can’t wait, our same day courier services in New York City bring your needs to the front of the line, ensuring an exceptional outcome for both you and your end-user. Why take a chance and risk stress with standard delivery service? When you call our team, you can rest assured that a successful delivery will be a given, not a gamble. But, don’t be fooled: we never cut corners with your delivery. In fact, we take extra measures to ensure that our courier service in New York City is executed in not just the fastest way, but the right way, too. Each of our rush messengers in NYC proudly wears our company colors, letting your end-user know right away that they can expect upstanding, professional service. Many courier companies in New York dismiss the notion that uniforms and branded vehicles are essential to 3PL success. Taking a different path, we at RDS Same Day Delivery present our brand across the board—from our vans and trucks, to our company uniforms and hats. This quick recognition allows our drivers to seamlessly pass through security clearances and, most importantly, instill trust and professionalism for our company. RDS Same Day Delivery utilizes the most advanced technology and 3PL practices. Real-time status reports, customized invoices, our dedicated mobile app—we’ve adopted everything for your benefit. Our drivers and medical couriers in NYC use this technology to streamline efficient, timely deliveries. Here in the Big Apple, it’s easy to feel lost in the crowd. But, just because the streets are busy, this doesn’t mean that you should settle for second-rate service. If you need same day courier services in New York City, turn to the team that only knows how to put people first: RDS Same Day Delivery.